The Jarvis Model SBR-2 – for perfect straight blade sharpening. 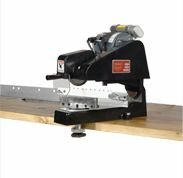 Ideal for sharpening blades for brisket, quartering and carcass splitting saws. Sharpens any size reciprocating blade up to 2.5 inches in width. Sharpens blades to original design specifications -reduces material removal for longer blade life. Precision ground teeth reduce operator fatigue, also wear and tear on equipment. Accurately regrinds badly damaged blades -grinds chipped or broken teeth like new. The SBR-2 produces perfect blades every time – nothing else is required.